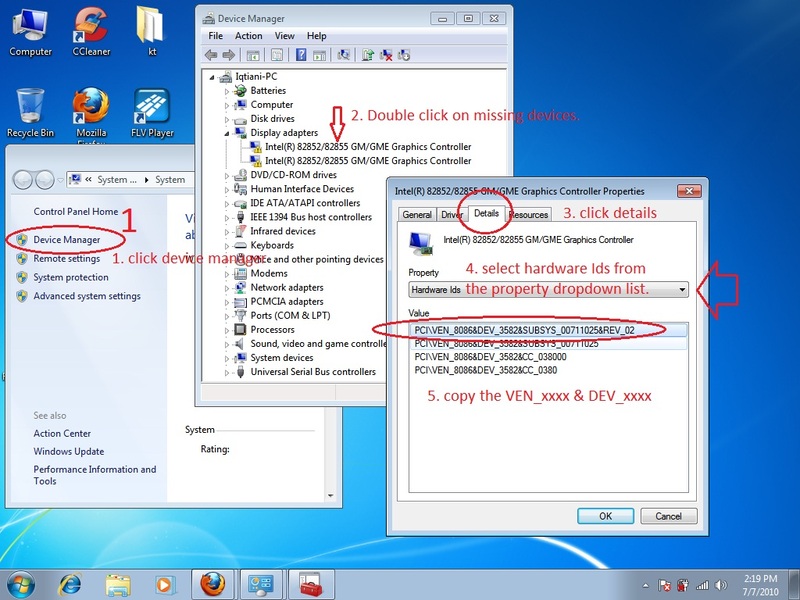 right click on my computer > properties > device manager >double click your missing devices > Details > select hardware ids on property dropdown list > copy the value PCI\VEN_XXXX&DEV_XXXXSUBSYS …. . (we want the bold informations). paste the VEN_xxxx&DEV_xxxx info on the comments area. we will find and give you the link to your requested driver. Do includes your email on your comments for us to reply back. Acer – desktop – Aspire e500 – xp pro. compaq – laptop – CQ40-506TU – vista. Acer – Netbook – AspireOne – xpro. Acer – laptop – Aspire4310 – xppro. – desktop – p4m800/775 – xp pro. Acer – laptop – Aspire 2920 – xp pro. Acer – laptop – Travelmate 4150 – xp pro. Fujitsu – laptop – fmv-7190nu4b – xp pro. HP compaq – desktop – dx7200 – xp pro. Dell – desktop – dimension e520 – xp pro. Acer – desktop – veriton 7100 – xp pro. – desktop – p4m800pro-m2 – xp pro. Compaq – laptop – presario v3658tu – xp pro. HP Compaq – desktop – dx7300 – xp pro. need to proceed with our new web site soonest for 2010 launch soon.